My big problem with most wardrobe schemes is they don’t fit my lifestyle. I rarely wear jackets or skirts or dresses. I feel the cold and need clothes for a casual active life. What I do wear is pants with many top layers including big shirts, tunics, and vests. 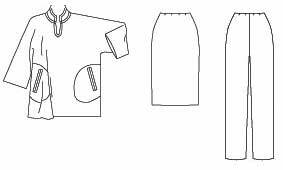 My clothes are most like the Sewing Workshop layering wardrobe (my post) – very top-heavy as I need things in the proportions : 2 bottoms, 4 tops, 8 layers. In mid-winter, I most need very loose fitting tunics/ big shirts that will go over the top when I’m wearing half a dozen sweaters. It must be possible to wear thermal long johns without looking like a bag lady. . .
I’ve been thinking I ‘ought not’ to wear these ‘big’ styles because a slim fitted look is current. So wearing big garments would show my eye for style is stuck in the 80s to 90s. But happily there are new oversized patterns. I did assume these proportions are intended for wear with leggings (the big top – narrow bottom proportion), but many of these patterns include straight legged pants. So perhaps I’m not the only person on the look out for this shape ! I’ve restricted this to patterns with more than 10 inches ease at bust level. 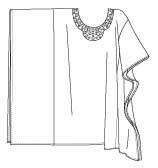 There are many good tunic patterns (especially from independent pattern designers), but most of them are somewhat fitted at bust level then widen at hip level. Good for warmer weather, but not what I’m looking for here. There are a couple of older big top patterns in the BMV catalogues. Butterick 5481 is for a big shirt-tunic. Vogue 8525 is a cut-on sleeve Vogue Woman pattern that has been around for a while. But otherwise, interestingly, most of the current Big 4 patterns with these proportions were issued in the last few months. So this is a good time to be looking. What is more modern about these styles is that most of them have cut-on, or occasionally raglan, sleeves rather than dropped shoulders. Simplicity 2289 is a new pattern by Patty Read. While for a Very Easy sloppy tunic there’s Vogue 8698. I don’t think I would wear this myself. I’m a practical person and don’t like big sleeves or cuffs that drape into everything I’m doing. . .
Butterick 5524 is one I’m thinking of making. This would work for me better as those sleeves are not full length. For knits there’s McCall’s 6205. And McCall’s 6242 is a new ‘smock’ style for knits. I would definitely leave off the tight hip band ! There are also many suitable ‘ethnic’ styles. Butterick 5494 is a new caftan pattern that looks fun. I might make this ‘circular’ caftan as it makes me laugh, even though sadly it looks rather droopy made up. In fact it looks as if it’s as impractical to wear as floaty style kaftans. A new version of this type is McCall’s 6125. I think I would constantly worry about knocking things over with all that extra fabric below my arms. Though I can see it as a fun beach or pool-side cover-up, made in a sheer fabric. 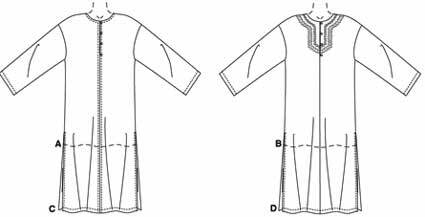 Most of the older patterns for generous sized tops are ‘ethnic’ in character. Such as the classic caftan in McCall’s 4002. Or a smock as in Stof & Stil 22013. 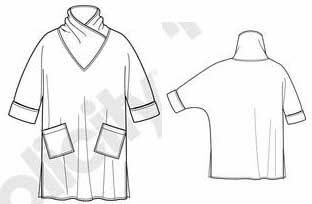 I love this type of smock style for warmer weather, but am not sure it would look good layered over thick sweaters. Following on from that, there are many suitable styles among Folkwear patterns, particularly in the Caravan section. And there’s Sewing Workshop’s Hudson top. The related Shapes pattern line has several possibilities. Though I might have to fiddle with some of those to get them to look good on my sloping shoulders. And there are half a dozen classic fleece top unisex patterns from McCall’s (see the end of the men’s section), as well as from Green Pepper and other companies that specialise in casual patterns. So there’s no shortage of pattern possibilities for making this sort of cover-up style. As each of the Big 4 has issued a ‘big top’ pattern this summer, it even looks as if they might be coming back as a ‘current’ though minority taste for proportions. Well, I haven’t actually seen anyone round here wearing one of these, let alone in Elle or In Style. Hmm. . . But this is a big gap in my wardrobe, whatever the fashionistas may say. This entry was posted on October 30, 2010 at 9:53 am and is filed under my choices. You can subscribe via RSS 2.0 feed to this post's comments. Both comments and pings are currently closed. Thanks for a great representation of what’s out there in this category. I like this style, but the leggings are not for me at all — because of age and shape. Through your site I’ve found pants patterns that will work well for the narrow bottom line, without being too close fitting. My problem is, I work in a school office and am not sure what to wear under it that I will be comfortable in once the top layer comes off and I’m at my desk and moving about the office all day. With the slim bottom, I’m still going to need something slightly flow-y that will allow me to use the computer comfortably. I have a couple of “big shirt” type patterns that I haven’t made up yet, and perhaps they would work with a belt that rides on the hip to bring it in some. And here’s something else that I never think of until I’m out the door in something like this: If you were going shopping, what kind of purse would you use with one of these large outerwear shapes? You cannot have a shoulder bag as it just won’t work. Then does a smaller bag look silly with this large shape? I can’t wear leggings at all either – saddlebags on the inside of my knees as well as the outside of my thighs, not a pretty sight . . but several of these big top patterns come with straight or tapered leg pants. If you’re wearing a big top as a layering piece, then you can wear any slimmer style under it. 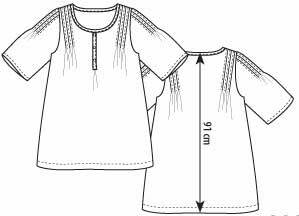 Check the finished garment size at biceps and bust level, and make sure the layer underneath is a couple of inches smaller. It’s just the necklines that need to look good together. 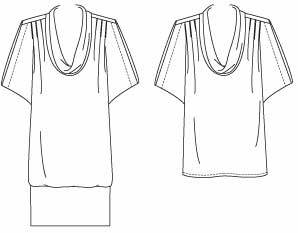 If you make a big top with an open neckline, you can wear a lot of neckline styles under it – classic shirt collar, convertible collar, raised neckline, turtle neck. . . I like backpacks, and they don’t work well with big tops either. Long ago I gave up wearing a shoulder bag when I realised I wasn’t standing up straight. I now use a basket with stiff leather handles. Slips over my wrist when I want to use both hands. – make a fabric bag but buy stiff handles from a bag making specialist. – look for more unusual bag patterns, perhaps McCall’s 6090, 5945. There are several in the Vogue accessories section. I especially like the bags by Marcy Tilton, and the unusual patchwork styles, but they may not be for you. I think a small shoulder bag (no weight) say 6″ x 6″ can look fun with a big top, but that may be a personal style thing. I also find wardrobe schemes not to be suited to my lifestyle. I don’t work in an office and I don’t go to formal afternoon teas either! So, I don’t need many dresses or skirts or suits. I also need casual active lifestyle garments. I end up with lots of bits and pieces but not a coordinated wardrobe…I keep trying! – would I feel happy wearing this ? – is it wearable with at least two other garments in my closet ? It may be easier for me to get co-ordinates this way, compared to many other people, as there’s only a limited range of colours and shapes that look good on me and suit my lifestyle.